The EU must back Theresa May's Brexit plan or risk the UK leaving without a deal, the most senior member of the UK PM's cabinet has said.Cabinet Office Minister David Lidington said the European Commission's proposals remained unacceptable.And he appealed for compromise from the EU side in Brexit talks.The EU's chief negotiator Michel Barnier said the EU was ready to offer the UK an unprecedented deal but it must not weaken the single market. 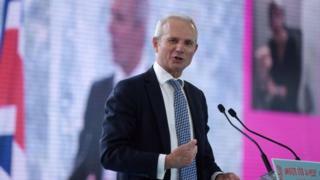 Speaking to a French business conference, Mr Lidington, who is Mrs May's de facto second-in-command, suggested there were only two choices on the table as Brexit talks entered a critical phase. "With exactly seven months until the end of Article 50 process and less than two months ahead of the October European Council, we face the choice between the pragmatic proposals we are discussing now with the European Commission, or the risk of there being no deal. "The alternative models do not meet the level of ambition or the outcome we all want to see delivered. "So, we need the EU to engage with us on our positive vision of the future relationship. "His message was softened from a version of the speech released to journalists beforehand, which had simply warned of "no deal".Mr Lidington was branded "arrogant" by the People's Vote campaign for another EU referendum, which added: "Good deal, bad deal or no deal, Brexit is a big deal and it must be for the people to decide." It came as Brexit Secretary Dominic Raab denied reports Michel Barnier has turned down UK requests for extended meetings in Brussels.Mr Raab was said by The Guardian to have been frustrated by the EU chief negotiator's alleged failure to make himself available for talks.But Mr Raab told a Lords Committee he had a "good professional and personal rapport" with Mr Barnier.And he would be holding a "long" meeting with him on Friday. Mr Raab vowed to increase the pace and frequency of talks with Mr Barnier when he took over in July from David Davis, who quit as Brexit Secretary in protest at Theresa May's white paper on trade with the EU when Britain leaves. "I'm confident that a deal is within our sights," Mr Raab told the Lords EU Committee. "We're bringing ambition, pragmatism, energy and if, and I expect it will be, and if it is matched, we get a deal." He added: "Firstly, in relation to whatever tittle tattle may appear in whatever newspaper, I shall be over in Brussels tomorrow (Thursday) evening for a long, substantive meeting on Friday, I hope that gives you the facts directly with Michel Barnier. "Britain is on course to leave the EU on 29 March. Both sides are hoping to agree a divorce deal and a statement on future trading relations by the next EU summit on 17 October - but Mr Raab suggested that deadline could slip, saying there was a "possibility that it may creep beyond" that date. On the "I don't think it could be safely assumed on anyone's side that the financial settlement as has been agreed by the withdrawal agreement would then just be paid in precisely the same shape or speed or rate if there was no deal. "And he rejected claims by pro-EU Labour peer Lord Liddle that any deal document was likely to be "vacuous" and "opaque", saying he expected it to contain a "degree of detail" and some "clear choices".Theresa May's chief Brexit advisor Olly Robbins will no longer have to face questions from MPs or peers, Mr Raab told the committee, which was holding a special meeting during Parliament's summer recess.The two men were grilled by MPs in a joint appearance before the Commons Brexit committee in July. But Mr Raab told the Lords EU committee that in future it would be ministers only - and not civil servants - that "come and be accountable" to Parliamentary committees over Brexit.Meanwhile Mr Barnier, speaking Berlin, said the EU was "prepared to offer Britain a partnership such as there never has been with any other third country".But, he added, it would not permit anything that weakened the single market. "We respect Britain's red lines scrupulously. In return, they must respect what we are. Single market means single market ... There is no single market a la carte," he told reporters.The pound rose 0.6%, to around $1.2950, after the EU chief negotiator's comments.